Frito Lay Choose You Own Adventure #Giveaway CLOSED!! With the new school year here for most and quickly approaching for others, its time to be going out and stocking up on those lunch supplies to pack in your lunch boxes. People love chips and I love that I can buy Frito Lay brand chips in a bulk variety of small bags that are perfect for those school lunches, for a really great price. I also love that the varieties are all flavors that my family love so there is no being picky about what bag they get in their lunches. 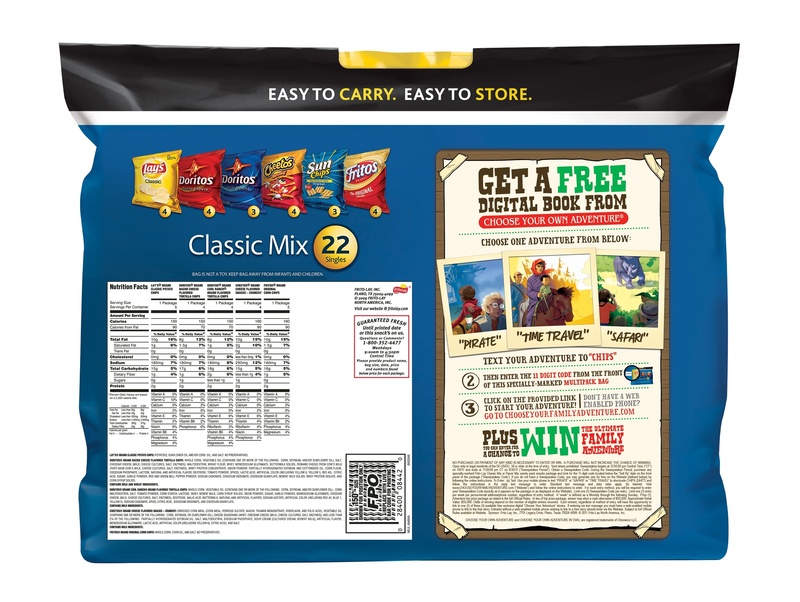 Well for this back to school season the wonderful people from Frito Lay are running a great promotion that gives you the chance to download three digital books from the Choose Your Own Adventure Books online. These books are great and tweens love getting lost in the stories. I was sent one of the books along with two of the awesome Frito Lay mix packs for review. Like I said the books are great, I gave the book I received for review to my daughters step sister, who as a pre-teen, really enjoyed the book. And as you can imagine, the mix packs of chips were of course a hit in my house. My kids love to get a bag with their sandwiches at lunch, they love being able to have a variety to choose from. I was sent this awesome pack through Mom Spark Media and Frito Lay. They would also like to give one of my amazing readers a $25 gift card and a boxed set of the Choose You Own Adventure books!!! Tell me what your all time favorite book is, please leave me your email with this entry!!! This giveaway is open to US residents. This giveaway will end at 11:59 pm on August 23 ,2011. Winner will be chosen at random.org and will be given 48 hours before another winner will be chosen. All products for reviews and giveaways are given as a sample from the companies. All opinions in reviews I conduct are my own. I was not paid to say anything or review any products. This review was made possible by Mom Spark Media. Thoughts are my own and I was given the products in exchange for this review!! I followed you on Facebook and Twitter! like you on fbjenzen69atyahoodotcomps i may have duplicates it is so hard when the comments are not visible. you may want to change that. My all time favorite book that I read to my kids is "How many trucks can a tow truck tow"